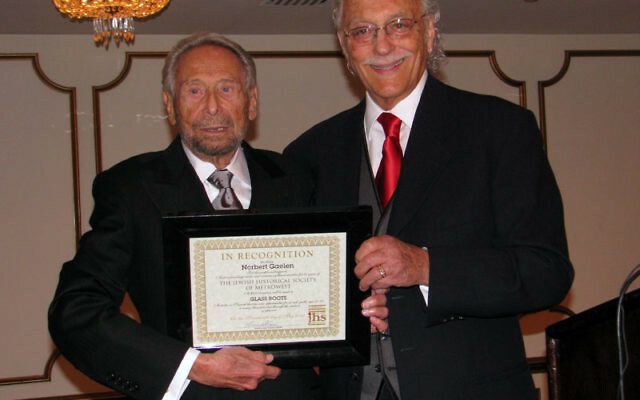 The Jewish Historical Society of MetroWest NJ celebrated its own past last week at a gala honoring one of its founding board members, Norbert Gaelen. Gaelen, who headed the O. Berk Company in his native Newark, was the honoree at the society’s Lasting Impressions Gala, held May 17 at the Crystal Plaza in Livingston. 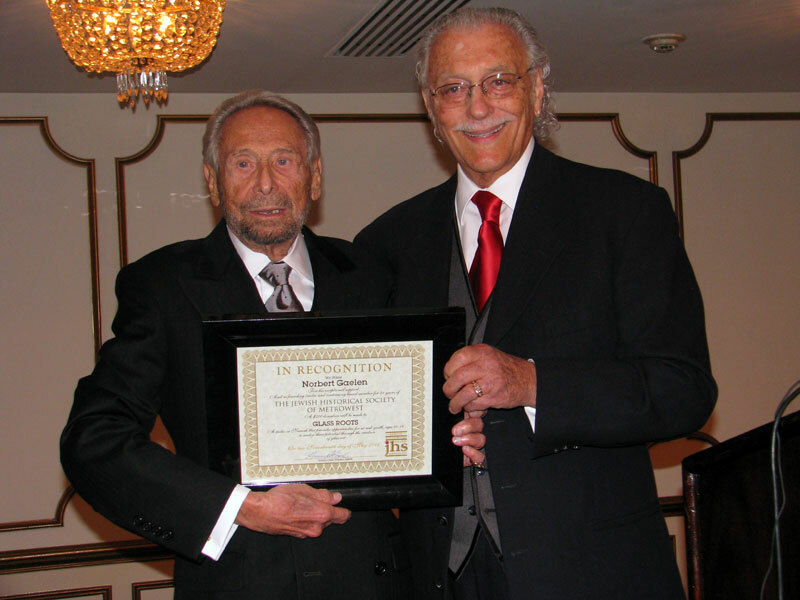 JHS president Howard Kiesel of Short Hills presented Gaelen with a plaque recognizing his role as a founder and major benefactor of the JHS, which documents the history of Jews in Newark and surrounding communities. Gaelen said he was lured into helping create the society by the late Ruth Fien, another Newark native who was the driving force behind the society’s founding in 1990. “This honor tonight makes me feel very special,” added Gaelen, a resident of Short Hills who, along with his wife Audrey, supports numerous local Jewish institutions, including the art gallery spaces at the Aidekman campus in Whippany and the West Orange JCC. The evening’s guest speaker, broadcaster Steve Adubato, also spoke about the need to preserve the history of Newark, where he too was born and raised. Adubato, a Star-Ledger columnist and host on NJN public television, spoke of growing up in a poor section of the city’s North Ward, where he had little knowledge of the Jewish community in Newark’s famed Weequahic neighborhood. Adubato, whose father, Steve Adubato Sr., remains a force as a Democratic power broker in the city’s North Ward, reminded his audience that Newark should not be defined by its setbacks. “The reality is there are at least two Newarks — one downtown, where there is money, there are the arts, there is culture, there is a sense of vitality and cops everywhere, and very few terrible things happen,” he said. “There is another part of the city — in the South Ward and the North Ward and the Central Ward. That is one that the kids I deal with every day have to live in,” referring to the work of his “Stand & Deliver” project, which trains inner-city youth in communication skills. Adubato lamented that Newark’s Italian-American community does not have its own society devoted to their history in the city. “When I look at the Jewish Historical Society and the work you are doing, I think, ‘My God, wouldn’t it be wonderful if we could have a repository like that,’” he said.